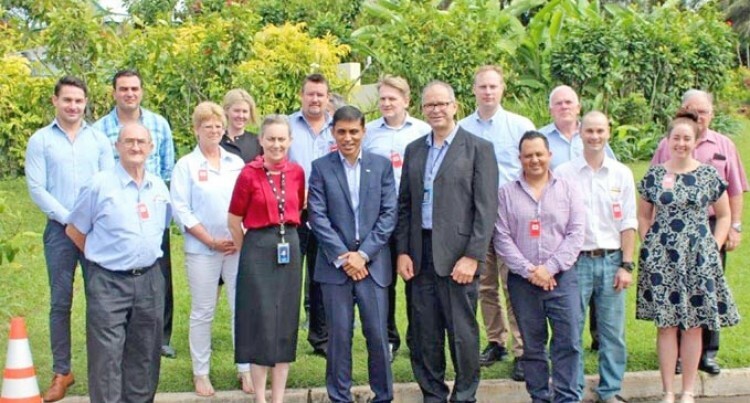 Permanent Secretary for Industry, Trade and Tourism, Shaheen Ali (front fourth left) with the Australian Building and Construction Mission representatives in Suva yesterday. The repair and maintenance costs of many resort properties is noted to be higher as a result of most materials being designed abroad and/or imported. Permanent Secretary for Industry, Trade and Tourism, Shaheen Ali, stressed this yesterday to the delegates of an Australian Building and Construction Mission. The delegation is here to understand the challenges or sourcing issues faced by Fijian businesses, particularly for those businesses importing building and construction materials. Mr Ali said most of the hotels/resorts projects being undertaken are mainly focused on attracting the high-end visitors’ market or are part of international hotel chain. “Hence, everything from the design to the materials are imported, specifically for the hotel or resort,” he said. “This means that the material used cannot be later sourced in Fiji or we do not have the expertise to undertake maintenance. “I believe you have visited a few hotels and resorts over the last two days and it would be evident the cost of maintenance and repair of those premises are high, primarily for the reason that every little thing is imported. “For example, Intercontinental Hotel has joinery designed overseas and the all the materials used are imported. On the other hand, Mr Ali said the Fiji Marriot Resort development at Momi Bay, is a well thought-out development. “The designs are made by foreign designers but keeping in mind local material or material that is easily available in Fiji,” he said. Meanwhile, the Fijian Government is encouraging competition and has welcomed foreign investment in the building and construction sector. This is given the potential there is to open doors to better technology, new expertise and new ways of doing business. “It is essentially ensuring that we are able to provide high quality materials and services that is required by the construction industry,” Mr Ali said. Mr Ali told the delegates they have the scope for opportunities in Fiji, as Fiji is in the middle of its rebuild and recovery phase, after the natural disasters of earlier this year. “The rebuild phase is combined with the boom already experienced in the building and construction sector,” he said. “Up till June 2016, domestic sale of cement, which is a partial indicator for construction activity grew by 10.6 per cent. “Furthermore, loans to private business entities increased to $206.5million, which was a $8.6 million increase compared to the same period last year. Therefore, Mr Ali said the demand for building and construction materials and also workers in this sector is relatively high, leading to shortage of building material and workers. “In order to meet the increasing demand of construction material, the Fijian Government has zero-rated import duties on basic building and construction materials,” he said.